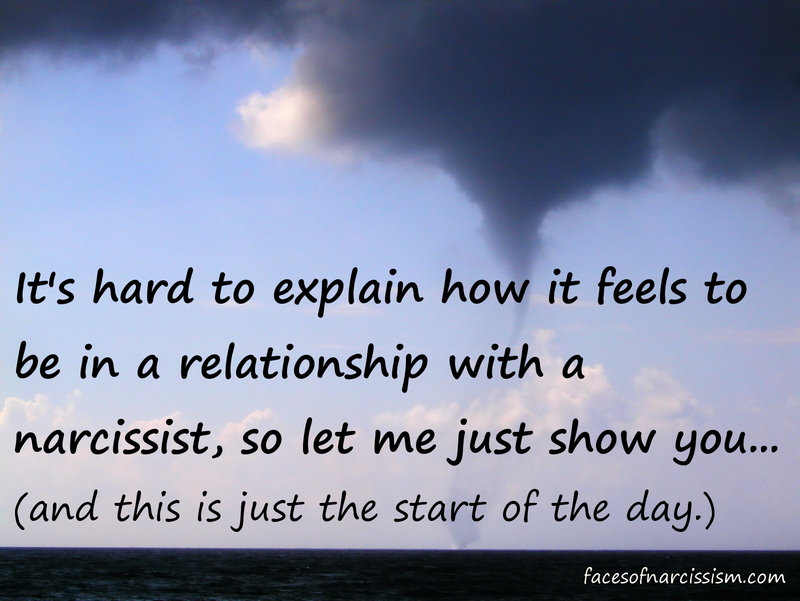 When you are dealing with a narcissist, they will lie to your face. They will gas light you and accuse you of things you know you never said or did. They will try to re-write history, they will claim they didn’t know things you told them, they will claim you told them things you didn’t. You may be having a discussion and they will state something that you know is false. Even if you are 100% right, if you correct them, they will not back down. They will stop at nothing to be “right” at all times. They will argue over the most outrageous things just to win. You can have hard proof that they are wrong, but they will never accept it. They will beat you down emotionally, mentally, or even physically to “prove” they are right. There are so many mind games and lies, you will feel like you are experiencing a mental tornado! You cannot win their game! So don’t play. No matter how much truth you have, you have to know it in your mind and keep faith in your reality. You have to let them “win,” because by doing that, you will actually be the winner. You will gain your peace and escape their verbal beatings. Ideally, it’s best to be completely no-contact with the narcissist, but if you cannot avoid them, you have to find the least painful way to deal with them. And that means letting them be “right” in their minds. There is a common saying that it is better to be happy than to be right. This is never more true than it is with a narcissist! I have found that “oh, okay” works well, then I change the topic, keeping everything positive and superficial. Then I get away as fast as I can! Just be careful with your tone of voice. Pleasant and slightly bored works, but if you show sarcasm or seem too sweet, the narcissist will probably realize you are blowing them off, (which is really what you are doing 😉 ) If the narcissist has any clue that you are beating them at their own game, that too will set off their ego and lead to more attacks. The key is to let them believe they are right and in control. As soon as you are away from them, go on about your life because you know the truth. Great post, and great advice! Narcopaths change plans ; do not communicate that and then change times and require you to do exactly what they have changed up without any consideration or patients as to you or your time. It is like dealing with a bulldog that is in your face and you are not giving a second; even if you say wait a minute, this is not what was agreed to; therefore, I will accommodate giving a moment to prepare to do what you need, although I was not informed of the change. The Gaslighting does start as the narcopath has NO concern for anyone but thier own selfish desire, want, and need. It is like being inslaved to a master and scrambling to keep the peace and do whatever just to avoid confrontational Gaslighting ! Right and true that it is not worth it to defend as this causing them to seek triangulation using others to convince that they are entitled to the win of any situation. Sick and cruel of them! I pray for thier soles. Does anyone have recommendations on have to break away from a narcissist. I am worn out,exhausted and heartbroken!!! Complete no contact! You just have to do it cold turkey. Even though I was being abused, I was tempted to keep trying rather than be alone. It’s not worth it. I finally deleted every message, every text, every phone number. Everything. I cut all contact and refused to ever talk again. (Until I had no choice in court.) Other than that, nothing. They will make you question your mind, your intuition and make you feel your crazy. I had constant pains in my stomach but he convinced me it was all in my mind. the doctor didn’t find anything when i went in the 1st time and my ex convinced me nothing was wrong. I didn’t explain my pain correctly because my ex already had me questioning if my pains were real. I dealt with pain 4 years until i was unable to eat. I went to the hospital, had several tests done and found out I had a hernia, 2 ulcers, an infection in my stomach and needed my gallbladder removed. I had a gallstone the size of an “Easter egg” the doctor informed me after my surgery. That’s how far the Narc will go to manipulate and gain more power over you.